Security objects are items, usually soft and easily held or carried, that offer a young child comfort. They also are referred to as transitional objects, substitute objects, cuddlies, soothers, "loveys," and security blankets. Security objects or transitional objects are items that help a young child make the emotional transition from dependence to independence. Attachment to an object often develops toward the end of the first year, although attachment to pacifiers happens earlier. Strong attachment to blankets peaks at 18 and 24 months, stays near this high level through 39 months, and then diminishes steadily. By five and a half, fewer than to 8 percent of children are attached to blankets. Other objects of attachment can be articles of clothing, cloth diapers, soft toys , or almost anything with a soft, pleasing texture. In the 1940s, attachment to a special object was regarded as a childhood problem reflecting an unhealthy relationship between the mother and the child. Gradually this attitude began changing as researchers concluded that the child's attachment to a security object is normal and even desirable. Nevertheless, throughout the 1970s, but progressively less in the 1980s and 1990s, a stigma remained attached to children who, like Linus in the "Peanuts" comic strip, hugged a blanket or other security object in times of stress. The subsequently discredited stereotype was that these children were overly anxious and insecure. As a result, the security object was often taken away from the child, sometimes forcibly, just when it could have been beneficial. As of 2004 research indicated that there is no justification for such drastic actions. Evidence does not find children abnormal or overanxious just because they demonstrate an attachment to a security object. 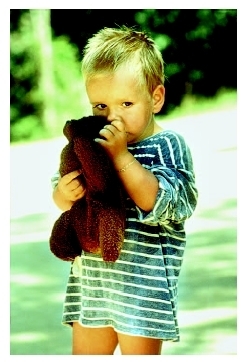 Blanket-attached children appear to be neither more nor less maladjusted or insecure than other children. Although several theories exist about the role of security objects in development, it is not clear from any of these theories why some children engage in comfort habits with security objects while others do not. Child-rearing practices are frequently seen as contributing factors, and evidence suggests that the security of a child's attachment to its mother does predict how a security object will be used in new or stressful situations. Despite thinking in the early 2000s that attachment to transitional objects is normal and almost universal, this attachment is actually culture-specific. For instance, in the United States, about 60 percent of children have at least a mild degree of attachment to a soft, inanimate object at some time during their life, and 32 percent exhibit strong attachment. The incidence of attachments to soft objects in the Netherlands, New Zealand, and Sweden is comparable to that in the United States. Korean children have substantially fewer attachments to blankets (18%) than do American children, but Korean-born children living in the United States display an intermediate percentage (34%). Only 5 percent of rural Italian children have transitional objects, compared to 31 percent of native Italian children living in Rome. However, only 16 percent of children living in London have a special security object. In the United States, attachments to various security objects are generally regarded as normal throughout the first five years of life. Attachment to a security object can be beneficial to a child. The security object may serve as a substitute for the parent in his or her absence and may assist separation from the mother or father by providing the comfort of something familiar. At bedtime, it can soothe and facilitate sleep . Studies have also shown that during a routine third-year pediatric examination, children allowed security objects were less distressed than children undergoing the medical evaluation without their security object. The comfort provided by a blanket in new situations has even been shown to enhance children's learning. Parents often become frustrated with their child's need for a security object as it falls to the parent to keep track of the object and soothe the child if it is misplaced or lost. Occasionally daycare centers forbid the child to bring anything from home, including a security object, causing unnecessary stress for the child. Child using his stuffed toy as a security object. these cases, it may be possible, with patience, to substitute one security object for another. Attachment to a security object is normal and should be outgrown without intervention by age five, although 8 percent of children still remain attached to blankets after this age. O'Halloran, Barbara Collopy, et al. Creature Comforts: People and Their Security Objects. Boston, MA: Houghton Mifflin, 2002. American Academy of Pediatrics. 141 Northwest Point Boulevard, Elk Grove Village, IL 60007-1098. Web site: http://www.aap.org. American Academy of Pediatrics. "Transitional Objects." Caring for Your Baby and Young Child. Available online at http://www.aap.org/pubserv/transobj.htm (accessed November 13, 2004). Tish Davidson, A.M. Richard Passman, Ph.D. This informaton was very helpful to me. My daughter is almost 11 months and just recently become attached to her "bear bear" a soft sguare blanket with a teddy bear head attached. Her father and I haven't been togther since she was born and is now going from house to house, I have stayed home with her since she was born and breastfed her. He does not think she should have it but I believe her "bear bear" has become VERY important during her transition so Thank You.